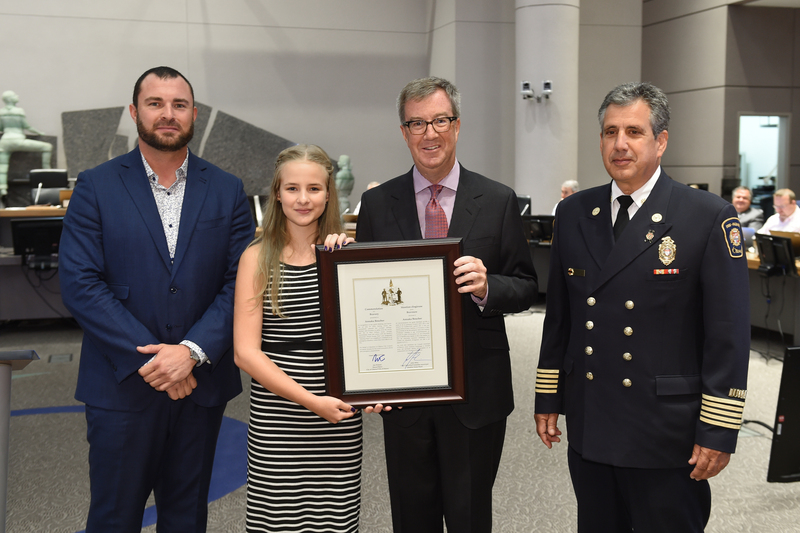 August 31, 2016 – Mayor Jim Watson and Innes Ward Councillor Jody Mitic presented 13-year-old Annaka Boucher with a Commendation for Bravery today in recognition of her actions to protect her younger brother and sister during a July 5 kitchen fire. Annaka was babysitting her younger siblings when she heard the smoke alarm go off and smelled smoke coming from the kitchen, where a toaster had caught fire. Annaka quickly enacted the family’s fire-escape plan and evacuated her brother and sister to a neighbour’s home. In addition to practicing the plan, the Boucher family had discussed why it is important to get out fast and not search for the family’s two cats during an emergency. Thankfully, firefighters were able to safely locate both pets which had retreated to somewhere safe in the house.